On Thursday, October 12, a small asteroid named 2012 TC4 will pass relatively close by our planet— at an astonishing 5 miles per second. This asteroid's last close flyby was in 2012, only days after it was first discovered. But you can relax: it won't hit us. Astronomers, of course, are not relaxing, but taking the opportunity to hone their ability to detect and anticipate future encounters with near-Earth asteroids, the legions of space-rocks whose orbits carry them to within 120 million miles of the sun. It is not uncommon for small asteroids to pass close to the Earth. At least a dozen have done so since the beginning of the year. What makes 2012 TC4's flyby special is that astronomers knew exactly when it was coming because of what they learned from its previous appearance five years ago. 2012 TC4 was discovered on October 4, 2012 by observers at the Haleakala Observatory in Hawaii, only days before its first known flyby of Earth. It was tracked for about one week by several observatories around the world. Then it disappeared once again, passing beyond our ability to detect it. Data obtained during that week of tracking five years ago gave astronomers enough information to predict another flyby of Earth this October 12, 2017. The first estimates for the distance at closest approach ranged from 4,000 to 170,000 miles from Earth's surface. That was an ominous range of uncertainty when you consider that 4,000 miles is about half of the Earth's diameter. Even a small asteroid could cause some local damage if it collided with us. Then, on July 27 this year, the asteroid was again detected, this time by the Cerro Paranal observatory in Chile, and astronomers have been tracking it ever since. Their observations have allowed them to refine a model of the asteroid's orbit and make a better prediction for this week's closest proximity: 27,203 miles, or an eighth of the distance from Earth to the moon. Close enough, but thankfully no cause for alarm. 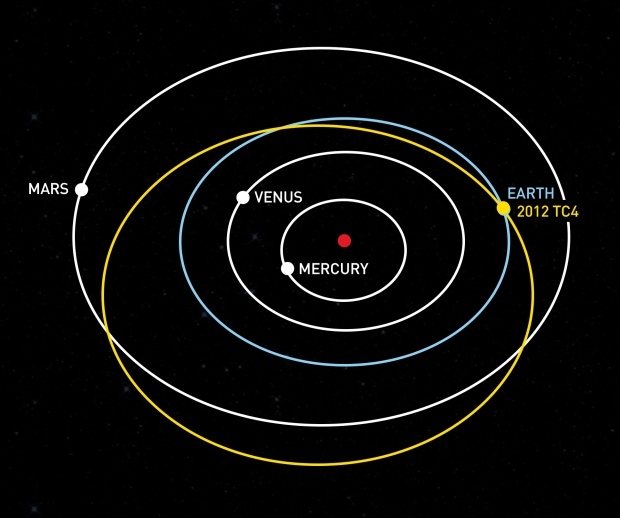 2012 TC4, which orbits the sun every 609 days, is estimated to be 40 to 90 feet across—perhaps a little larger than the asteroid that exploded in the atmosphere over Chelyabinsk, Russia in 2014. That rare event caused a blinding fireball and a shock wave that shattered windows over a wide area, even knocking down some brick structures. A few days ago, on October 8, the asteroid was still about a million miles away from us, and has been drawing closer ever since. At a million miles, or about four times the distance from Earth to the moon, this rock appears merely as a faint, star-like dot even in powerful telescopes. In fact, it is their appearance as pinpoints of light that earned these objects the name "asteroid," which means star-like. The intense interest in understanding the orbital trajectories and physical properties of near-Earth asteroids is driven by the fact that these space rocks, large and small, can and have collided with Earth, and will again. The more we learn about them, the better able we are to predict whether and when any given asteroid will strike our planet. 2012 TC4 reminds us that the solar system is populated by millions of these chunks of rock and metal that regularly pass by Earth. 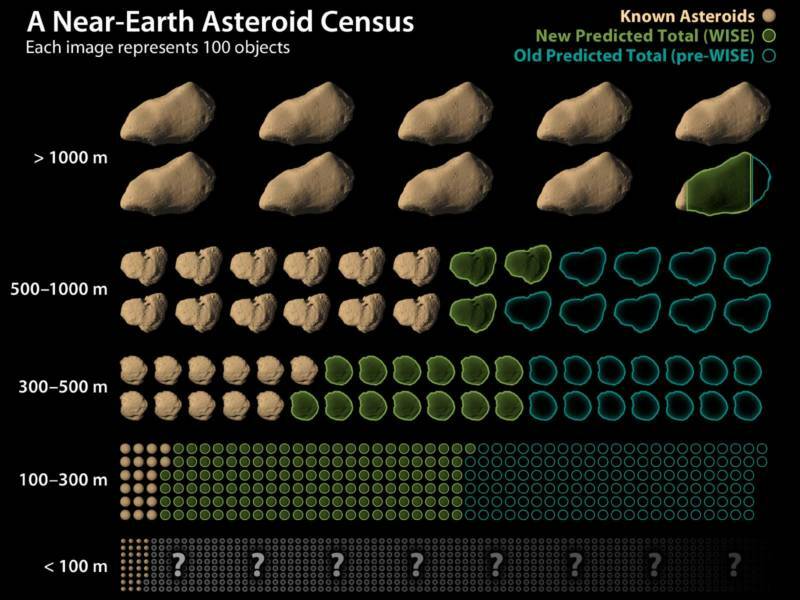 Most of these asteroids are so small they can only be detected when they are close. These "stealth" asteroids literally come at us out of the dark, with very little warning. Fortunately, smaller asteroids do less damage when they collide with a planet. But a collision with the largest of near-Earth asteroids—those that are like mile-sized mountains—would cause a global catastrophe. The good news about these giant asteroids is that we already know their locations and sizes, and none are predicted to collide with Earth in the foreseeable future, at least a century. Collisions with these behemoths only happen on average every 100,000 years. But about every 10,000 years an asteroid of the 300-foot variety hits our planet, devastating the region it hits. Arizona's "Meteor Crater,"a hole almost a mile wide and 600 feet deep, was formed 50,000 years ago by the impact of an asteroid of the 200 to 300 foot size. Shards of hot debris and dust from the impact would have rained down across a wide region, laying waste to the land. In 1908, in Tunguska, Siberia, an object of similar size that was either an asteroid or a comet exploded in the atmosphere, flattening 700 square miles of forest. The 2014 Chelyabinsk event in Russia's Ural Mountains—also an aerial explosion—was produced by a 60-foot asteroid. 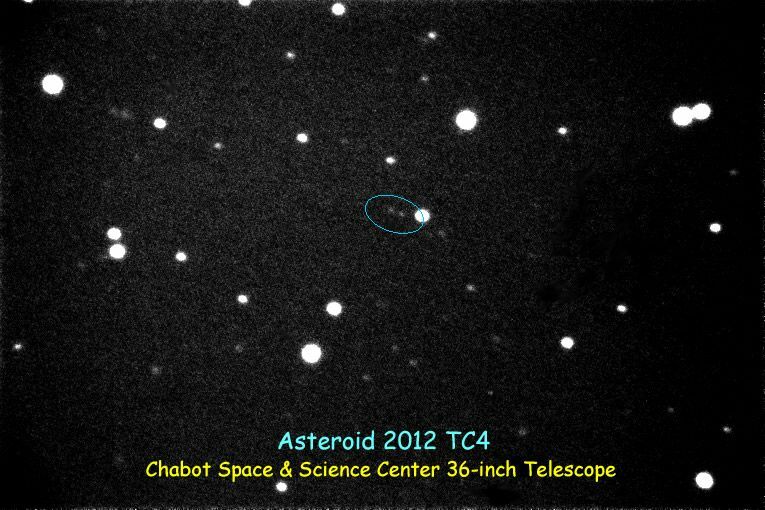 After the upcoming flyby of 2012 TC4, this tiny asteroid will again recede into space and disappear from view. But the encounter will give astronomers an even better understanding of its orbit, and maybe some of its physical characteristics, making the next flyby prediction more accurate. Data from 2012 TC4's flyby will not only improve our ability to anticipate similar encounters, but will increase our chances of defending ourselves if and when a potentially destructive asteroid is found to be on a collision course with Earth. The more we know about when, where and how big an impact will be, the more lives might be saved by evacuating people from ground zero, or devising a way to deflect the asteroid before it even hits.